Abuja (Agenzia Fides) - The suspected killers of Fr. 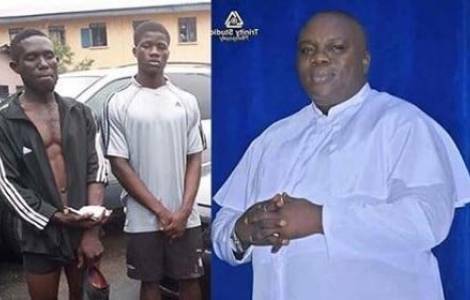 Jude Egbom, parish priest of St. Patrick's Parish Amucha, shot dead on the evening of 10 September in Umuwala, in the State of Imo in southern Nigeria (see Fides, 12/9/2018) have been arrested. The suspected killers Chigozie Uzoukwu, 33, and Peter Ochokwu, 21, were arrested in Nkwerre on 11 September. According to the police, Fr. Egbom was attacked by the assailants at a barber’s shop where he had gone to have a hair cut at about 8pm. After killing the priest they stole his bag and his car. The police, which mobilized a special unit, managed to capture the fleeing criminals and recover the priest's care and bag.